Itinerery for ‘Er Yue Er’ 2019 – Guizhou C.I.T.S. 1: Three festival can be seen. A) the ‘Er Yue Er’is the special day for the local people to offer worship to bridges. Many Miao and Dong people in Southeastern Guizhou Province have rituals by burning spirit money and offering sacrifices to the bridges. Among all the rituals, it is held the most grand in Zhaitou village. B). 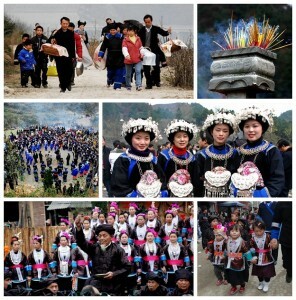 Fangu Festival is one of the Miao festival in the western part of this area. 2: During the same time, you can see the special Zhaitou-style Miao costumes. 3: Visiting Baojing Dong village with the same costumes as Zhaitou Miao. 4: Visiting Fanpai Miao village that is located in the mountain where it also holds a very serious ritual for offering sacrifices to the bridges. 5: Visiting Langde, Qingman, Shiqiao Miao villages. 6: Visiting Matang Gejia village. 8: Visiting Benli, Yudong, Dimen, Zhainan, Huangguang, Xiaohuang and Zhaoxing Dong villages. D03(07/03): Visiting the Miao villages around Leishan, including Langde, Paika and Shuidian and short walking through the rice fields with some running waterwheels. In the afternoon drive toward Zhaitou. Stay overnight nearby. D04(08/03): Enjoining the ‘Er Yue Er’ Festival activities the whole day (in the early morning the people walk about 3-4Kms up the mountain while carrying different sacrifices to the certain place to prepare food and others for the ritual action. All the participants eat there on the mountain, then some dance and play Lusheng flutes after offering sacrifices to their bridge). Stay overnight in Jianhe or nearby town. D05(09/03): Jhe-Lli: Visiting Fanpai Miao village in the mountain with black costumes, then visit Tyong rural market. Stay overnight at Lli. D06(10/03): Lli-Zhao: Visiting the special Dong villages of Benli and Yudong, and the Miao village with mini-skirt and orange-thread embroidery costumes. Stay overnight at Zhao. D07(11/03): Zhaiao-Lpg: Visit the Shdong Dong village where there is the single-column drum tower, which is so called the embryonic-form drum tower, Dimen Dong village with three drum towers, four roofed bridges, three opera stages and all Dong-style wood architectures and short walking to Zhainan Dong village through wild mountain path. Stay overnight in LP. D08(12/03): LP-CJang: Visiting the beautiful Dong villages of HuanGang, XHuang and Bpa, people live in these villages are living relative traditional life, so spinning, weaving, dyeing cloth in indigo and other textile techniques can be seen here and there, and their wooden architectures are kept well as well. Then in the afternoon, visiting Bha Miao village, which is so called ‘the last Gunmen tribe’. It is only village in China that the hunting guns are allowed to exist. Men look like the ancient warriors with long-hair chignon on their head. Women are working with different textile techniques. D09(13/03): CJang-Jbng-CJng: Visiting the magnificent terrace paddies. In China the most spectacular terrace are in Yunnan’s Yuanyuang, in Guangxi’s Longsheng and here in Guizhou’s Jiabang. The former two are well known for long time, this one has just been found recently by some photographers and now people start to pouring in. On the way some stops are available. D10(14/03): CJg-Zhing. Visiting this biggest Dong village and short walk from Tang’An village. Stay overnight at Zhxing. .
D11(15/03): Zhxing-Lnge: Enjoining the Chunshe celebration at Long’E by the Dong people, where singing, dancing, local costumes show and other activities can be seen then. Stay overnight at Dzhai. D12(16/03): Dzhai-KLi. Visiting the Fangu Festival at Miao villages. Stay overnight in KLli. D13(17/03) KLli-GYang. Buffalos fighting and Miao women dancing can be seen around, or drive to the airport/bullet train station for next destination.